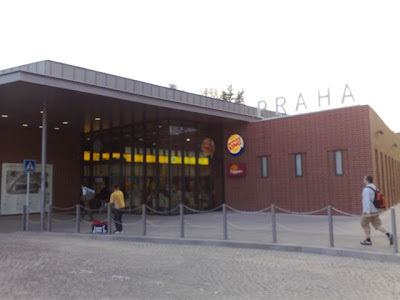 I've been to one of Prague's newest Burger Kings -- the one at Florenc Bus Station. I'll keep this one short -- I already reviewed Prague's very first BK at the Metropole Zličín mall nine months back. 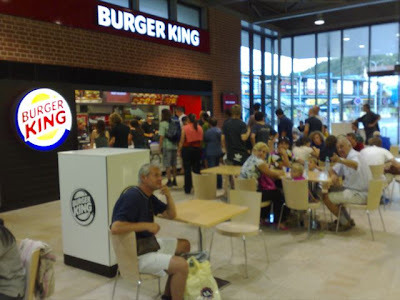 I can report that it is pretty much the same as most other Burger Kings. The first time, I was there, the line was long and slow. The second time, I walked right up and ordered. I had Whopper menu meal for 109 CZK. I just thought I'd share how it looked. It was nice to see the modern facilities they've built to improve the station. It was a total dump before. It's not finished yet, but it's a good start. I've also tied the Burger King at the main train station. It is certainly the best looking and largest outlet so far. As a child, I loved McDonald's over BK, but now, I can't stand Mickey D's. It gives me a stomach ache. As far as fast food goes, the flame-grilled burgers at Burger King are among my favorites. Perhaps the novelty will wear off, but for now, I still say it is good to be at Burger King. my colleague says he likes BK abroad more than in Prague. that the taste is not the same. what's your opinion? same thing or not? btw. new burger place in Vinohrady! neighboring the Damascus guy across from Balcan guy - I think Slezska? It's true, the best tasting, best constructed BK burger I've had was from a spot outside Munich. But the worst ever was in Sitges, south of Barcelona. Prague's taste fine, though -- pretty standard. I'll have to find this burger place in Vinohrady. Let me know if you have more details. I'm a big fan of the Potrefena Husa burger nearby. Burger King I don't mind, McDonalds I don't mind, but what I really want to know is how Subway manages to smell so horrible. I mean, baking bread should be one of the nicest smells in the world. Today I was at the new burger place. It was somewhere between terrible street food you can here and restaurant stuff. I have mixed feelings. It was handmade and full of fresh ingredients, on the other hand it was not something I would go for soon. I also got large fries, that were OK, McDo equivalent. I asked for coleslaw, they don't have it. But they made me a half portion of meal-size salad full of fresh veggies and balcan cheese. Finally, BK downtown. Don't get me wrong, I'd almost never eat there or at any most other chains in North America, but a "greasy spoon" diner / cafe here is not equivalent in taste or cost in case of a serious grease crisis. Regarding taste differences, I've certainly noticed them between certain items in certain countries. McDo seems to be most uniform, but is that a great thing? Yeah, whatever. I personally hate the buns that fall apart when you bite into the burger (nevermind the taste). A shame Wendy's (or even better, In-and-Out Burger) can't get their acts together and get over here. Harvey's on Vaclavak was great -- even had draught beer! -- but sadly short lived. Ach jo. But making your own burgers is not difficult. Buy yourself a meat grinder and buy local "steak" to grind. Almost all the prepackaged ground "beef" I've tried here is horrible. No need to add extra spice; pure ground beef tastes great on its own even if you have to resort to pan frying. As Brewsta says, get yourself a BBQ; that's the way to do it. Harvey's on Vaclavak? There is no mention of international expansion of this Canadian chain on Wiki whatsoever. And more importantly, I am a Czech and I think I would have noticed it... Unless it was like ages ago... was it? Harvey's was here. 100%. Not for very long. But in '95 it was here. Trust me. Maybe it wasn't even sanctioned by the real Harvey's, but the logos, food, etc. were the same, for better or for worse (but it had DRAUGHT BEER!!!). I don't remember the exact building, but (looking down the hill from Museum), it was on the left side, after Mustek. I believe in the Ceska Sporitelna building, though I wouldn't swear to that; very very close though, if not. Ah, 1995. That explains it. Well, it's a shame they didn't survive. Thanks for the info, anyway.